These shrimp would be the perfect appetizer at a backyard BBQ, accompanied by (of course) a fresh Margarita. 1. Prepare the marinade: zest the entire orange and entire lime, then juice each. Add zest and juice to bowl. Grate the tomato (use a Microplane or cheese grater), catching all the pulp and juice in the bowl with the citrus. Add the tequila, garlic, thyme, and cayenne, and stir to combine. Add salt to taste. 2. Peel shrimp and, if necessary, devein. Keep the tails on – this helps them qualify as finger food. Place shrimp in gallon-size Ziplock bag and pour marinade in. Make sure the marinade coats all the shrimp, and let the shrimp marinate in the refrigerator for 1-2 hours. 3. Remove shrimp from bag, reserving marinade, and place in grill basket or on skewers (if you skewer them with wooden skewers, make sure to soak the skewers in water for an hour first). 4. 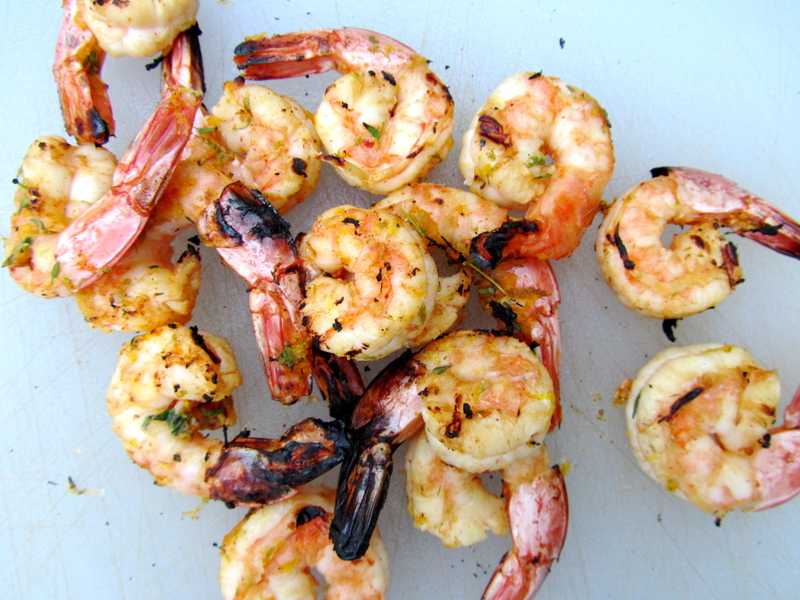 Grill the shrimp – they need about 3-4 minutes per side, depending on their size. Meanwhile, pour the marinade into a pan and bring to a boil – instant dipping sauce! 5. Serve shrimp with sauce on the side – and a Margarita, too! This entry was posted in grilled, pescetarian, seafood, Sweet Life Laur Original by Laura Zolnoski. Bookmark the permalink.